Constitution for the new Islamic Republic of EU and USA is under construction. Meanwhile American laws will protect us. Koffi Annan will pass politically correct sympathetic statement for Jihadists. Keep your Nukes in your curio cabinets. Keep your aircraft carrier or high-tech weaponry in the showcase. You can't use them against us because of your own higher moral standard. We will take the advantage of your higher moral standard and use it against you. We won’t hesitate to use our children as suicide bomber against you. Moderate Muslim will say there is no link between Islam and Terrorism and the West will believe it because the West is so gullible. 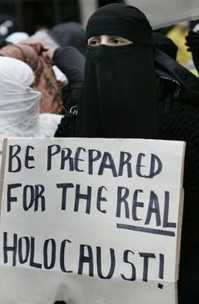 Moderate Muslim all over the world will incubate Jihadists by their talk by defending Islam. Using Western Legal system we will assert our Sharia Laws, slowly but surely. We will increase in number. We will double again. 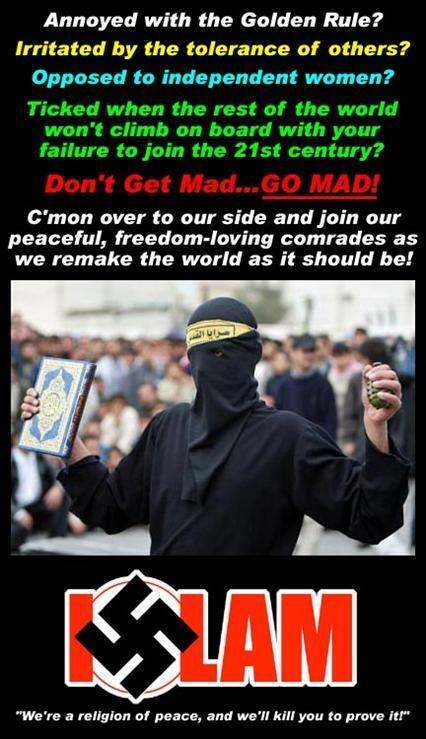 We will recite Quran and say Allah-Hu-Akbar before beheading infidels, as we have been doing it. We will video tape those and send it to all infidels to watch. They will surrender - ISLAM means surrender, not peace. Must be very depressing for you. Isn’t it? as we say just before beheading. Let's see the effectiveness of Islamic warfare. Muslims Vs. the West. THE RULE HAS CHANGED. There is new game in town. Bill Clinton ordered 50 Tomahawks Cruise missiles costing $100,000,000 each to destroy $50 mud houses that belonged to Osama's family. What a stupidity? What a poor ROI (Return On Investment) In return Osama's attack on the US. Cost: 19 martyrs and less than $500,000.Cost to the West: over 3,000 dead. At least $1,000,000,000,000 (one trillion) dollars economical loss in one year. This includes the ripple effect. Osama's ROI with respect to: life = 3,000/19 = 158 fold.Dollar = $1 tr./500K = 2,000,000 fold That is modern warfare. The West will loose. Allah-Hu-Akbar. Islam will rule the world. There is nothing you can do. Even if the per capita GDP of the world drops to half of its present level as a consequence of Islamic laws in place all over the world but still Islam will rule the word. From your point of view we bring to the world to the dark ages, so be it. But still Islam wins, West looses. Saudi Arabia's $100 billion investment over the last 3 decades on over 60 thousands Madrassas and school all over the Islamic world is finally paying off. While the West was busy inventing medicine, increasing life expectancy, decoding human gene to find cure for Cancer, heart disease etc, launching space shuttle, inventing internet, working on new laws/theory for human rights, developing better economical models for a more prosperous world, while ACLU was gaining control over common sense, while American ingenuity was benefiting the rest of the world, we Muslims were busy producing over 200 million out of 1.4 billion, Walking, Talking, Non-Thinking, West-Hating, Pre-Programmed, Suicidal, Parasitic, Terrorist Robots. You can't win. The Genie is out of the bottle. We will use American’s kindness, fairness, compassion, freedom of speech and non-discriminatory policy against them. We will stab them in the back. What are you going to do? You are doomed. Hey Americans! Look at what this guy with what appears to be a rag on his head is saying about you here. (Yes, 'rag on his head' would be thinly veiled innuendo.) Click on 'view clip'.